SPEEDHIDE® Interior/Exterior WB Alkyd is our commercial grade water-borne alkyd designed as a spray or brush and rolled-applied, interior/exterior finish coat for wood, plaster, wallboard, metal and masonry surfaces. 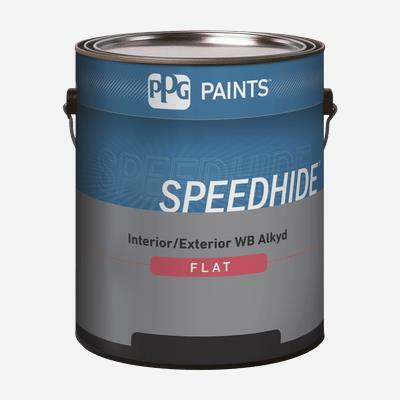 SPEEDHIDE® Interior/Exterior WB Alkyd is a low VOC replacement for traditional alkyd enamels providing alkyd hardness and durability. This coating is formulated to provide excellent gloss retention, flash rust resistance, and adhesion. This product’s tough, durable finish has good block resistance and is resistant to mildew formation on the paint film. This less 50 g/L VOC product with low odor makes it suitable institutional, commercial and residential applications.